Matt Talbot Kitchen & Outreach was founded by Catholics and has become a diverse community of servants, called by God to nourish and empower one another in a spirit of dignity and love. The Mission of Matt Talbot Kitchen & Outreach is to serve the physical, emotional and spiritual needs of Lincoln's working poor and homeless through outreach, advocacy, education and the provision of food and shelter. Matt Talbot started in 1992 when Mary Costello saw an unmet need in Lincoln and reached out to homeless people by serving a meal on Saturday nights. The need was great so Mary, Ruth McKinstry and a few others reached out to their churches and found that more people wanted to help. Soon meals were served every day through faith- based, inclusive and completely volunteer efforts. Since that first meal in 1992 over 2.3 million meals have been served to those who hunger for food and a better life. In 1999, after assessing local needs and consulting with community leaders, the Board of Directors took a leap of faith and hired Susanne Blue to become the first Executive Director and expand services beyond meeting the basic need of nutrition. Ms. Blue has led the community kitchen and outreach center for the past 20 years and developed many programs designed to comprehensively address the needs of the homeless and near homeless. Today Matt Talbot is a permanent fixture of Lincoln's safety net with volunteers providing two meals a day and professional staff offering a wide range of outreach services to prevent and alleviate homelessness. It is a mission of feeding in the broadest sense of the word in an environment that encourages empowerment, nonviolence and mutual respect. Matt Talbot Kitchen & Outreach is named after an Irish Catholic man born in 1856. Matt starting working as a messenger for a wine merchant at age 12, began drinking heavily and was a confirmed alcoholic by the age of 13. He continued his alcoholic ways until, at 28, he vowed to quit drinking and devote his life to working and doing penance. He remained sober until he died in 1925. Matt supported his sobriety with prayer, spiritual reading, worship, and community support. In 1975 Pope Paul VI declared him to be Venerable Matt Talbot which is a step toward sainthood. For alcoholics of all faiths, his life provides a powerful example of conversion, recovery, and hope. 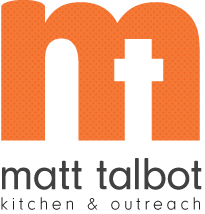 Matt Talbot Kitchen & Outreach is one of many agencies throughout the country and world that bear his name.